Anybody who’s been watching the classic Japanese car craze of the last five to ten years will know the alphanumeric 4AGE engine designation. Even if 22R and 2T-C don’t mean much to you, 4AGE still means the sweet, revvy inline four cylinder with a Yamaha designed head, famous for appearances in Toyota’s MR2, Corolla GT-S, and Corolla FX16. 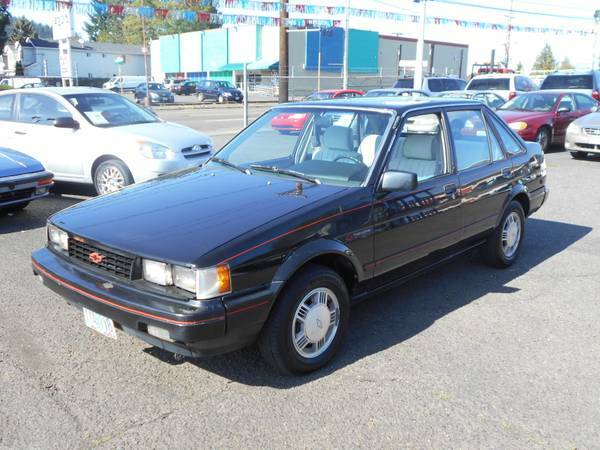 However, the engine also made lesser-known appearances in cars like the Geo Prism GSi and this 1988 Chevrolet Nova Twin Cam for sale for $3450 in Portland, OR. The late 1980s Chevrolet Nova was a slightly modified version of the Japanese-market Toyota Sprinter, built at GM’s NUMMI factory in Fremont, CA. It’s a nice if somewhat bland looking car, and if you squint, you might see influences from Italian designed cars like the Saab 9000/Fiat Croma/Lancia Thema triplets and similarities with the Isuzu I-Mark and Hyundai Excel. For the most part, it was a boring, efficient tin can of a car, until Chevrolet attempted to increase the profitability of the model by dropping in the not-yet-famous 4AGE. That strategy was not so successful, and only 3300 units were sold. 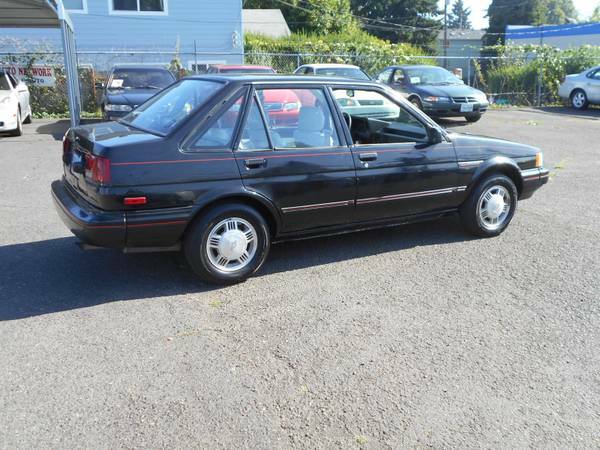 Fortunately, many were sold with a manual 5-speed, and all came in a very 1980s blacked out on grey interior with angular-yet-small alloy wheels. It also came with a sport suspension, tachometer, and four-wheel disc brakes. The car is said to have no rust, and overall it makes a very clean impression with glossy black paint, red pinstriping, and a clean pale grey interior. The leather cover on the steering wheel does show some wear, but that’s not unexpected at 145,000 miles. The interior also features a recent stereo and, on the left of the steering column, something that appears to be an ancient radar detector. The tall glass house is nice, and should allow for great exterior visibility. There’s something to be said for the rarity of this car; collectors pay money for a sixties Nova with a rare options package nowadays, so how long will it be before a Chevy or Toyota collector seeks one of these out to round out the collection? Alternately, how about surprising a few folks at the local Japanese classic car show with a Nova retrofitted to look like a Sprinter, much like the Corolla GT-S is JDMed with Levin parts? This entry was posted on November 4, 2015 at 8:00 am and is filed under Feature. You can follow any responses to this entry through the RSS 2.0 feed. You can leave a response, or trackback from your own site. Now I have another car on my wish list. Nice find. Previous owner must not have really known what they had for it to end up on a used lot vs. a private sale. This or the Prizm GSI has to be the most rare 4AGE offering. 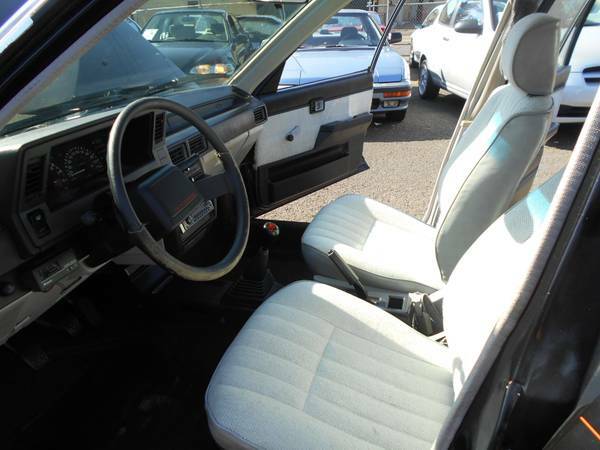 Regarding the module to the left of the steering column, it was common back in this timeframe to have either an aftermarket cruise control or intermittent wiper control. I think either of those is more likely than a radar detector given the size and location. Had no idea there was a twin cam version of the Nova. This has to be top dollar for this one. But where would you find another, let alone one this nice?